The workshop organized by Museum Catharijneconvent in cooperation with the foundations Ars Graphica and Delineavit et Sculpsit, was attended by over a hundred participants, ranging from students to curators and emeriti professors, all with a specific interest in the graphic arts. The two main printrooms, of the Rijksmuseum and Museum Boijmans Van Beuningen, were represented by most of their staff. The theme of this afternoon workshop, hosted by the museum’s curator Micha Leeflang, was ‘research projects in Dutch museums’. Presentations were given by Alexander de Bruin, Ilona van Tuijnen, Ilja Veldman and Yvonne Bleyerveld. The latter two are the authors of the new issue of Delineavit et Sculpsit (43), which is a catalogue of thirty highlights from the Museum Catharijneconvent’s collection of Old Master drawings. This issue was financially supported by the Fondation Custodia and the Museum Catharijneconvent. The first copy was presented to Micha Leeflang and our foundation’s chairman Charles Dumas. Subscribers present at the meeting, including seven new ones, were handed their copies which offered good reading on their way home. After the lectures Albert Elen informed the participants about the major grant which the Museum Boijmans recently received from the Getty Foundation under their new initiative ‘The Paper Project’. This generous grant will allow the Rotterdam museum to hire three successive fellows as well as a research assistant to work with him on the scholarly collection catalogue of the museum’s early Italian drawings from the period 1400-1600. The fellows will at the same time receive practical training in the museum’s printroom, which will help them qualify for printroom positions which will become vacant in 4 to 5 years from now. The audience was reminded of the call for candidates on the museum’s website (deadline 15 June 2018). 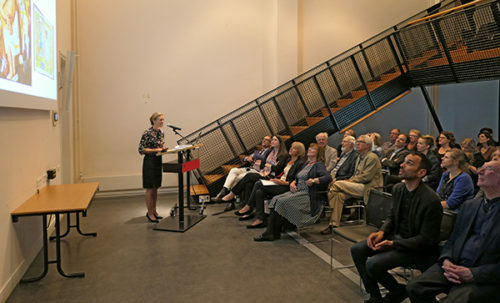 Jane Turner, editor of the periodical Master Drawings (and head of the Rijksmuseum printroom) announced the first annual Ricciardi Prize of $5,000 for the best article on a drawings topic by a young scholar under the age of 40 (deadline 1 October 2018).